A lot of non-Japanese people will be aware of the traditional tea ceremony. They may know the history of it, the intricate process, and the religious origins, but very few people outside of Japan truly understand the meaning of it. Even in Japan not everyone fully understands the significance except those who are truly dedicated to it, and people who are expects at preparing Matcha tea for these traditional rituals. Make no mistake about it; the tea ceremony is a discipline in every aspect of the word. Zen Buddhism is the probable creator of the tea ceremony as it is practiced in Japan today. The first two people to bring the tea serving rituals across to Japan were Chinese Buddhist monks. Both monks helped establish the ceremony that is now practiced. Though many aspects of Zen Buddhism can only be understood from the inside. Buddhism is in itself a very inner practice. Therefore any outward ceremony of Buddhism would reveal little about the inner meaning of the behavior. The tea ceremony and the practice of meditation are two examples. You can’t tell what is happening to someone meditating just by watching them. It’s the same for the tea ceremony. You can watch the tea ceremony and even take part in it, but you still won’t learn anything about the true nature or message of the ceremony. Just like everything else to do with Zen the tea ceremony has both an inner and an outer aspect. One could argue this structure of inner and outer is the dominant Zen influence on the traditional Japanese tea ceremony. 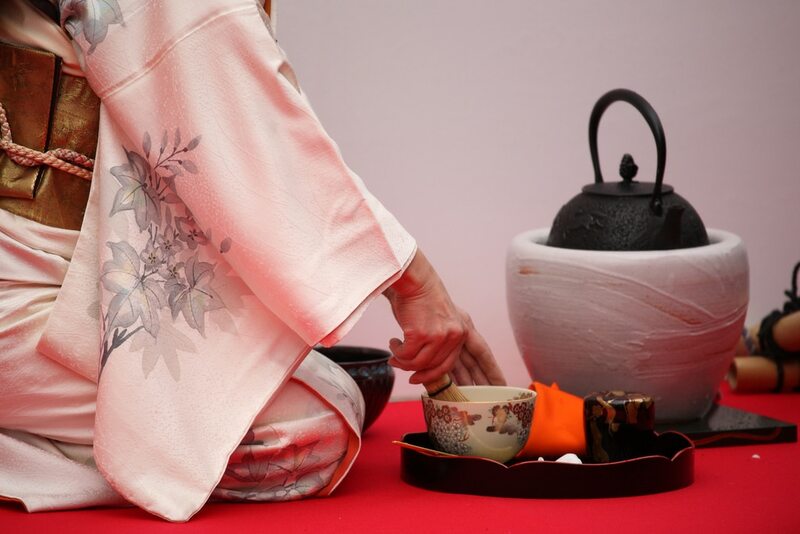 The inner part of the tea ceremony is an emphasis on the simplicity and naturalness of the ceremony. These two things are what give the ceremony an outer appearance of peace and simplicity. While the outer portion of the tea ceremony focuses on “Sabi”, the Japanese concept of material life. You will notice this when you look around the tea room and see the weathered and old materials that make it up. They serve as a reminder that our physical life is a fragile and temporary thing that will eventually end. Whether you believe it or not there is a lot of science behind ritualised tea ceremonies. Even modern experts accept that both sides of the brain become stimulated as a result of the Japanese tea ceremony. Stimulating both sides of the brain brings calm and a level of spiritual consciousness to the people taking part. Keep in mind that the tea ceremony affects all five of the senses and it does so by design. It was designed by Buddhist monks to wake people up, both on the outside physically and on the inside spiritually. It would also bring a real feeling of peace and tranquillity to those taking part by bringing their mind and body together. When all five senses are working together the left side of the brain has plenty to think about, including the ritual; the tools, process, and “facts” of the tea ceremony. The left portion of your brain is made for this kind of thing. Meanwhile the right side of the brain is busy focusing on the beauty and atmosphere of the room and how everyone in the room is feeling. This whole experience of both sides of the brain working together equally is where you can see how Zen fits in to the tea ceremony. Zen Buddhism generally works along these lines; with both sides of the brain stimulated to the same degree and giving insight. So what is the Hidden Meaning to the Japanese Tea Ceremony? Japanese people who wish to learn more about the secretive tea ceremony take the step of forming a club to study it. Some of the people in this informal club move on to more formal ones that can include expensive lessons from a master of tea. Tea mastery is on the same level as martial arts with different ranks and certificates associated with the highest level tea schools in Japan. It can take a full lifetime of study if you wish to truly dedicate yourself to the tea ceremony. Just as you would have to dedicate your life to mastering an instrument, people truly dedicated to the tea ceremony may have to dedicate their whole lives to mastering it.